Revolutionary Paris just prior to the rise of the Jacobins and the Reign of Terror. Nouveau Plan Routier de la Ville et Fauxbourgs de Paris. Unlike many cartographers, esnauts and Rapilly survived and even thrived throughout the French Revolution. 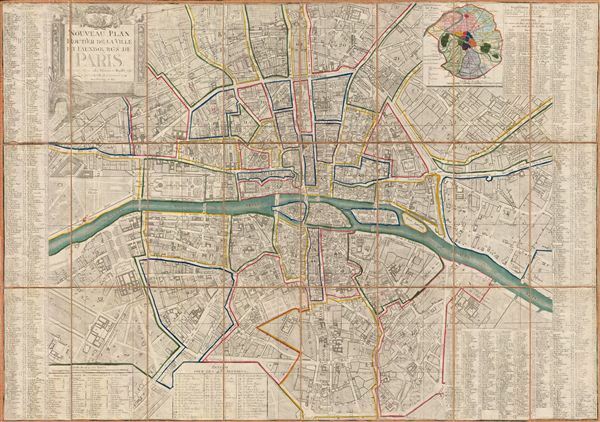 This map was first issued in 1777 and updated regularly through the early 1800s, thus offering a fascinating cartographic overview of one of Paris' most dynamic and terrifying historic periods. Very good. Dissected and mounted on linen. Folds into original gilt-stamped leather pocket. Vallee, Leon, Catalogue des plans de Paris et des cartes de l'ile de France, (Bibliotheque Nacionale), 1151, GE FF 3511.